While in Leicester (see the previous story! ), we took the opportunity to sit down with Nigel Rooms of the Anglican Church’s Church Missionary Society (CMS) to hear about a project they’re running called the Partnership for Missional Church. Now if you’ve hovering in church circles, you’ll have stumbled across this word ‘missional’ more than once or twice in the last few years. It’s a conversation that has quite a head of steam as we continue to ask the question “what does it mean for a church to be shaped in response to its understanding of God’s mission” (or something like that). CMS, through this program, are endeavouring to help local churches reflect on this kind of question, and to turn their attention to the notion that God is at work in their world, and the question of how to join in. These are, in a sense, the classic questions of the missional movement. It also incorporates a heavy emphasis on discipleship – through five practices: dwelling in the word, dwelling in the world, announcing the kingdom, hospitality (of which more in a moment), and corporate (collective) spiritual discernment. It all hangs on a range of ‘ologies’ including theology, sociology, missiology, ethnography and so on. The process seems in some ways to be a carefully assisted change process. The community is introduced to the capacity to understand itself, it’s world, and it’s God in new ways, and then supported as it responds to those new understandings. There were, once again, a few topics explored in the course of the afternoon that captured my attention. The first was the mention of hospitality. At risk of being something of a broken record, this is a topic I’ve wondered about before – in particular the tendency in our world to put ourselves in the place of host when we think about hospitality – whereas the Jesus stories are filled with encounters in which Jesus is the guest rather than the host. Learning to be guest in our communities, and to see God at work in the world and life of our host is a critical skill. The second related to an observation from systems theory about the interplay between process and outcomes. The theory (as I heard it expressed) suggests that in a given situation we can either control the process, or the outcomes, but not both. In the Partnership for Missional Church exploration, the attempt is to manage the process – and to let the outcomes be whatever they may be (or whatever God may determine…to take a slightly more theological tone). The PMC journey is a carefully managed process, but with not pre-determined, or even preferred outcome envisaged before it begins. What will be, will be. I’m drawn to that approach. Thirdly, we heard that there is a body of research that suggests that local churches learn best from one another, than from professional trainers and consultants. As a kind-of-consultant, I of course rankled at this suggestion…but only for a moment. 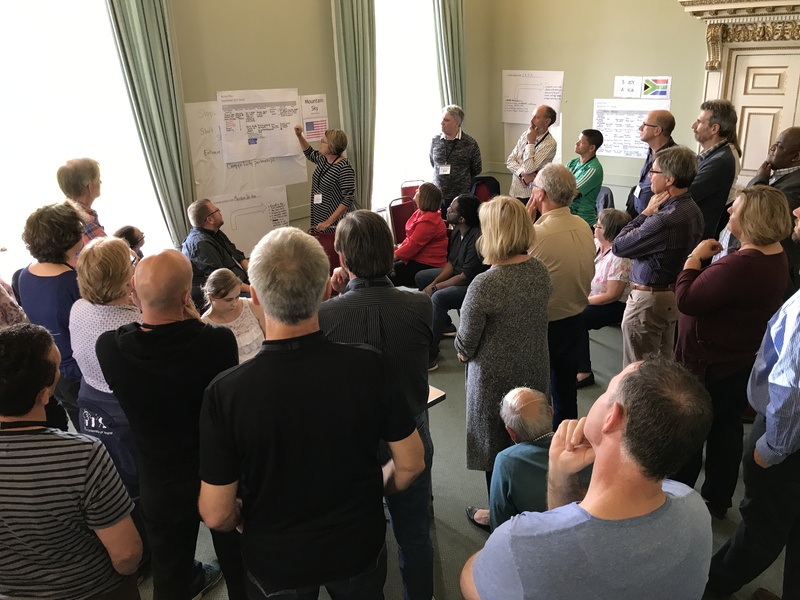 Of course there are times when insights from outside are helpful, but it does seem intuitively true that peer learning is a powerful tool – and that local churches (or their leadership teams) in conversation with one another can learn a great deal from one another’s experiences. Which reinforces the importance of great relationships with neighbouring congregations. Let’s not be out there going it alone! The next postcard is a few days away. We’re now gathered with teams from around the world in an International Learning Community on fresh expressions of church. We’ve collectively agreed on a social media fast for the duration of the gathering (in terms of the gathering itself and the conversations we’re having here), so that we can be fully present to one another, and allow the full process of the gathering to work its way through out thinking. I’ll tell you though that it’s been incredibly stimulating, and there are lots of thoughts and questions I’m wondering about. I’ll be back to say more in the next postcard. Recently I sat down with Ben Rogers, editor of Journey magazine to record a chat about leadership – and specifically about Christian leadership. Below is the video of our chat, and here’s the article that precipitated the conversation. And, if you’re a glutton for punishment, here’s some more of my potentially baseless musings on leadership. On the weekend just gone, Sheri and I took our kids out to Girraween National Park. If you haven’t been there…you should go. Just saying. Girraween is just out past Stanthorpe in what is known as the Granite Belt. 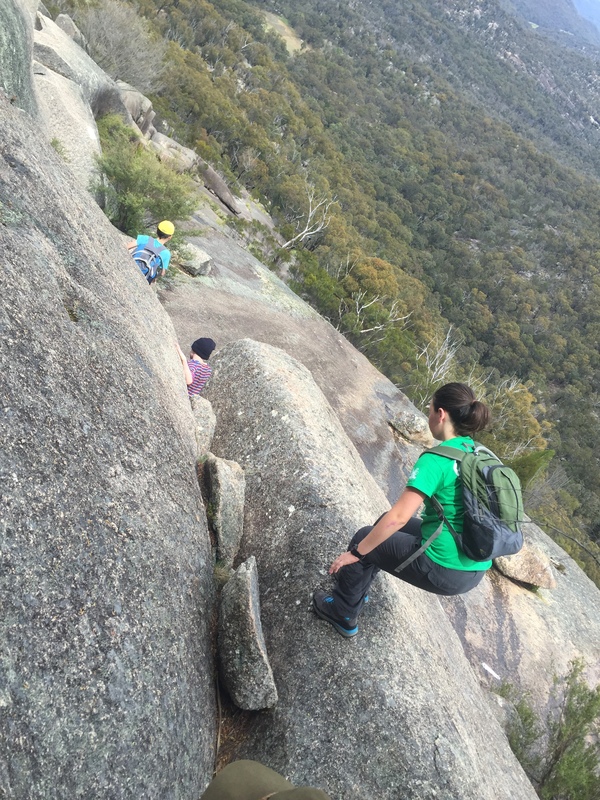 And it’s known as the granite belt for a good reason – it’s a giant playground of granite boulders of varying sizes. Some of the boulders are small enough that you can lift, or sit on them. Some are the size of your car, or your house, or some are literally whole mountains made of granite. It’s an incredible place to explore and enjoy. And not even some rain on Saturday ruined the weekend for us as we played and wandered. 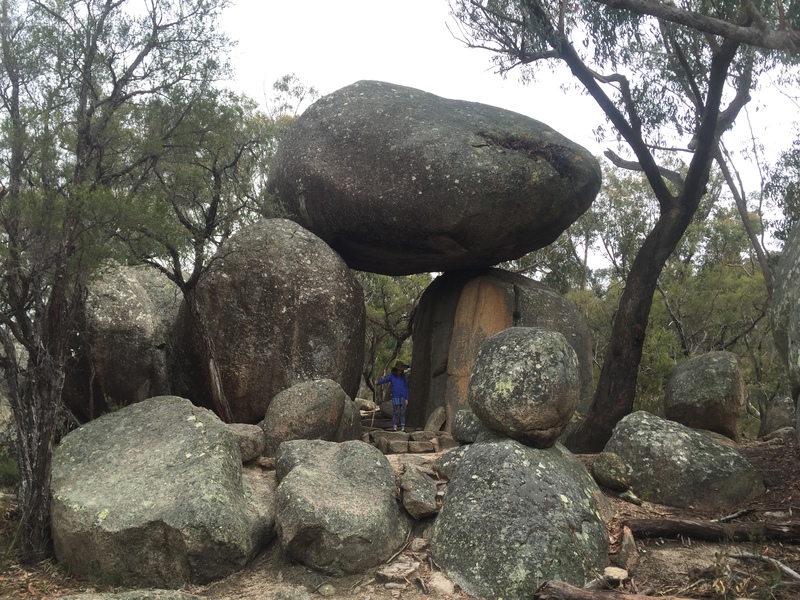 One of the incredible features of Girraween are the ways these boulders are piled up, or balanced upon one another. Take this one, for example. It’s called Granite Arch. Kind of a natural Stonehenge looking feature, with the capstone balanced on the lower two. Amazing. Nearby are a couple of mountain-sized lumps of rock called “The Pyramids.” The first one is walkable, the second is technically off limits. They’re incredible to look at, and even more so to explore. High up on the first pyramid, the one you can climb by following a marked path, is a boulder generally known as “Balancing Rock”. See if you can guess why when you look at the photo below. 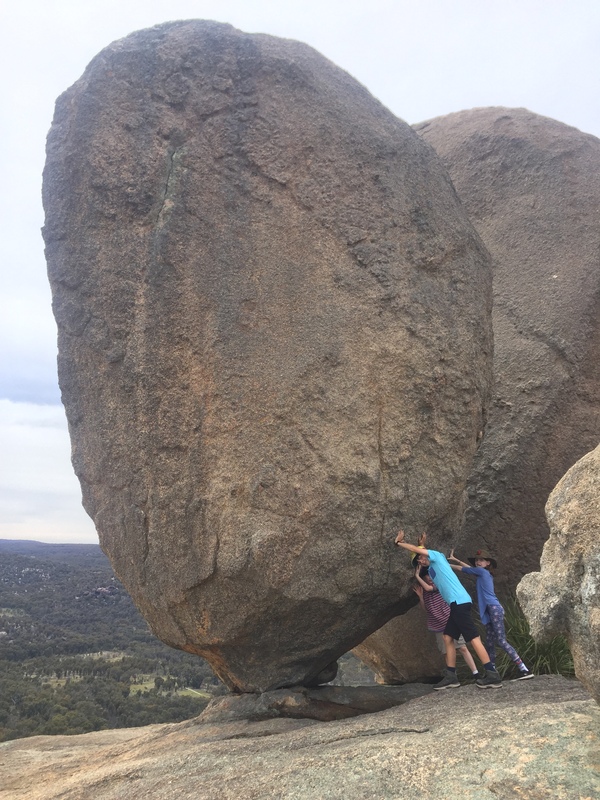 The kids, along with some friends, joined the long, long, long list of people who’ve tried and failed to topple this rock from its perch. It’s perfectly balanced, standing on its end, on top of a mountain. And as I stood and looked at it, I couldn’t help wondering what probably everybody else who’s made the climb thinks: “How does it stand there?” It’s centre of gravity must be just right, and the fact that it is perched on a firm foundation keeps it there, through rain, hail, wind and the attempts of 12 year old kids. It’s been there day after day, year after year, decade after decade, probably century after century. This rock is balanced, perfectly. The challenge to visiting Balancing Rock, of course, is climbing up, and then back down this mountain-sized monolith to see it. On this journey up and down the steep slab-sided pyramid it’s a case of the balancing person. Keeping a firm footing, a balanced centre of gravit, avoiding obstacles or damp patches, and keeping focused on the path ahead are the key. Balance matters to us as climbers, just as much as it does to the rock that stands. Balance matters as much when we are in motion, when we are living life actively, as it does when we are just trying to stand firm. Balance, centre of gravity, firm foundations: these things matter not just to rocks. But to people, to communities, to you and I. As I walked I wondered what it means to be balanced in life as while walking, as while being a rock standing on top of a mountain. What does it means to be on firm footing? For me one of the things that means is that I wonder what the story of Jesus has to say into that space (for you it might be something totally different). Jesus on multiple occasions talked about rocks, balance and firm foundations. He used a metaphor about the value in building our house (our life) on rock, not on sand. He talked about building his church on a rock. He talked about the importance to balance in life of seeking God’s kingdom first – that other things will take care of themselves. Where does balance come from in my life? Where are firm foundations found? What does it look like when everything is in balance? Is it all in balance right now? If not, what’s missing? Those are the questions I’ve been pondering this week. Maybe they’re of interest to you too. NB: Before you read, it might help to know that this is the text of a message I shared at Toowong Uniting Church, August 9th 2015. It refers to a story from Acts 4:26-40. The context at Toowong is that they are preparing to plant a new congregation. If you’d rather listen than read…skip to the end of this story for the mp3 file. It seems to me that this life that we live is made up of moments. If you think back over your life, I’m sure you can identify a few of them. I think of the moment I saw Sheridan walk into a friend’s 21st birthday party and I instantly knew that I wanted to spend the rest of my life with her. I think of the moment I made a bad decision and tore up my knee, ending up in surgery just weeks before our first child was due. I think of the moment I learned a huge lesson about leadership, as I sat quietly to one side during an outdoor education program I was helping to run. I think of the moment when I woke up one morning and realised that for the first time in 6 years all the kids had slept all night. Some moments are wonderful, some not so much. Some are extraordinary, while others are just the moments of everyday life. Some moments, like my encounter with Sheri at that 21st birthday party, change our lives instantly. And we know it in the moment (or at least, I knew it…you’ll have to ask Sheri about her experience of that moment). Others take a while to reveal themselves – and sometimes it’s only with the benefit of hindsight that we can see the power of that moment. Such is the story for my learning about leadership on that outdoor education program. The moment actually passed unremarkably that night…but the more time passes, the more I reflect on that moment…the more it means to me. This life that we live is made up of moments. I’m sure you can identify a few of them. In this passage today, this story of Philip and the Ethiopian (read it here Acts 8:26-40), there’s a lot going on, and we’ll work our way through some of those things over the rest of our time. But at the heart of it is a moment. A chance encounter. The intersection of two people’s lives that changed both of them forever. Such is the importance of a moment. And this life that we live is made of them.